rock-on-collectibles has no other items for sale. 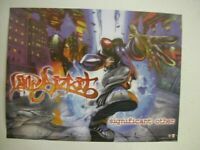 DISCONTINUED LIMP BIZKIT FRED DURST Caution Cloth Fabric Poster Flag-RARE-NEW! Store Hours are Monday through Thursday from 9 AM to 4 PM CST. Please note that items purchased over the weekend or outside of our normal business hours will be processed the following business day. If you have any questions please feel free to contact us. Rock On!